John Ogilby [Wikipedia] (November 1600 – 4 September 1676) was a Scottish translator and cartographer best known for publishing the first British road atlas. His Britannia road atlas published in 1675 comprised 100 plates. 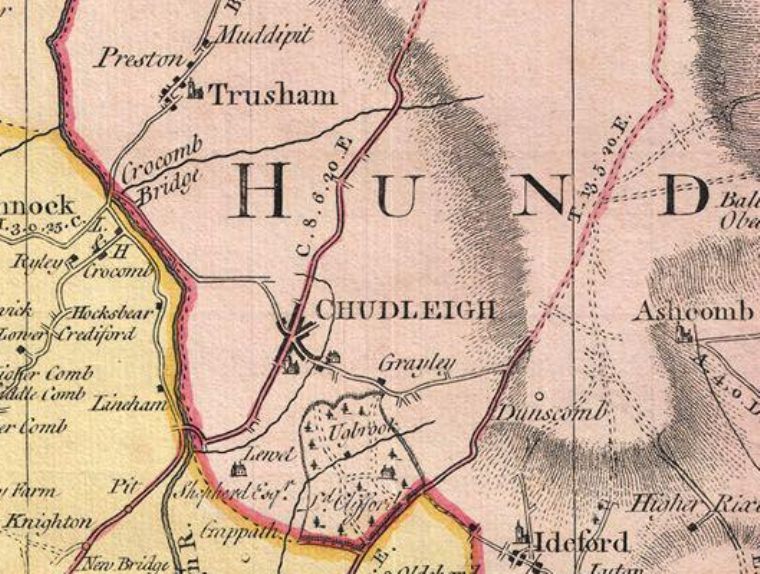 Chudleigh being on the route from London to Plymouth was included in plate 27 and that extract is shown above. Benjamin Donn [Wikipedia] or Donne (1729 – 1798) was an English mathematician. In 1798, Donn published a map of Devonshire – a survey he undertook himself and for which he received £100 from the Society of Arts. He published further maps of the West Country and produced mathematical instruments. John Graves Simcoe [Wikipedia] (February 25, 1752 – October 26, 1806) was a British army general and the first Lieutenant Governor of Upper Canada from 1791 until 1796, and was a founding father of York (now Toronto) and the developement of Upper Canada. Due to ill health, he returned to Britain and lived (and died) in Exeter, his mother's birthplace. Simcoe was buried in Wolford Chapel on the Simcoe family estate near Honiton and has a memorial in Exeter Cathedral. This copy of the map has come to the CHG from Canada. The original is held in the Non-Canadian Papers in the Simcoe Papers Collection. They were given by the Simcoes to the University of Toronto; The University of Toronto transferred them to the Archives of Ontario which have now moved to York University, still in Toronto. The map dates from the year that Simcoe resigned his post in Canada and, as a military man, perhaps had the maps drawn up of places he might visit. There is no known direct connection of Simcoe with Chudleigh. 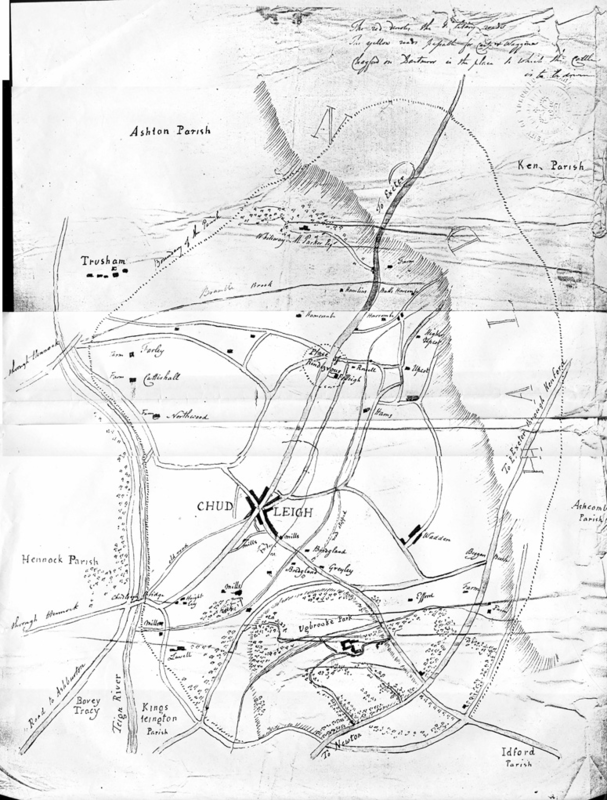 Ordnance Survey maps were the result of the first ever national survey of England & Wales. From the late 1790s until 1874, surveyors covered every corner of a then mainly rural country. The maps recorded the landscape details with every farm, track, copse and hamlet, many of which would have been unchanged for centuries and reflecting ancient patterns of settlement dating back to Saxon times. The first OS Old Series Edition – one-inch-to-the-mile (1:63,360 scale) – maps were first published between 1805 and 1874; most of southern England being completed by 1810, a third of England & Wales by 1822 but the complete set was not available until 1874. The Cornwall, Devon & Somerset maps were published in 1809. 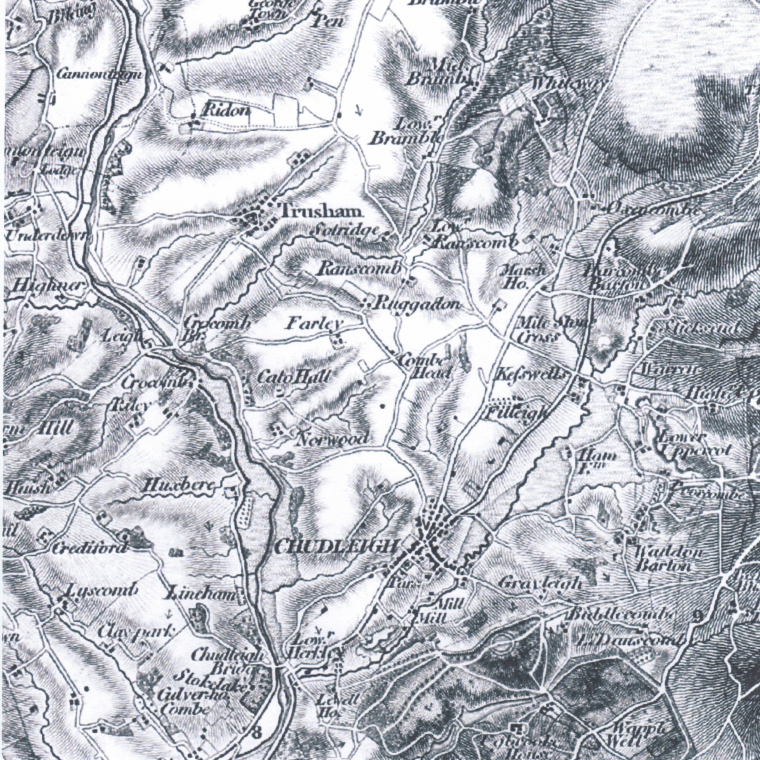 An extract from the Ordnance Survey 1st Edition (Revision) of about 1824. Although labelled Old Edition 1809, it is believed that the above Devon sheet is not earlier than the Revision (correcting errors and omissions in – and new features like canals and road since – the original surveys) of c1822–1834, as it shows the main road to Exeter via Harcombe Bends which was only created by the Exeter Turnpike Trust in 1822. The exact date is uncertain, but we infer from the OS histories that the above revised map sheets for Devon were published early in the period, around 1824. A tithe map indicates the ownership of all parish properties – whether building, field, orchard, etc – for tithe (tax) purposes. 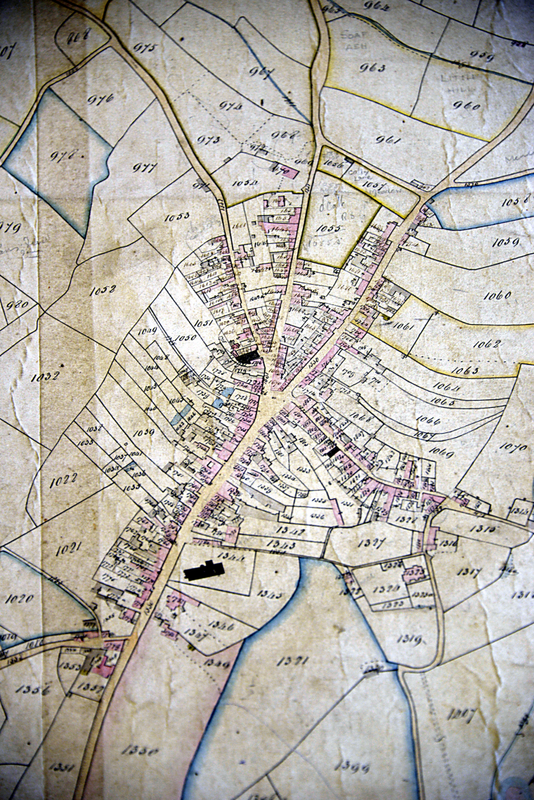 The Chudliegh tithe map of 1838 has a number against every such property and there was a companion Tithe Apportionment list, providing a 'look up table' to convert the numers on the map to the name of the owner of that property. The map is drawn on several sheets of velum glued togther, forming a complete parish map some 5 x 4 metres in size.